After six straight years of declines, the U.S. is expected to see a 0.2% increase in university enrollment once final student counts are totaled for the fall 2018 semester, according to the National Center for Education Statistics (NCES). An expected average increase of 1.1% during the outlook period charted above would to take post-secondary enrollment to 21.1 million nationwide in 2023. 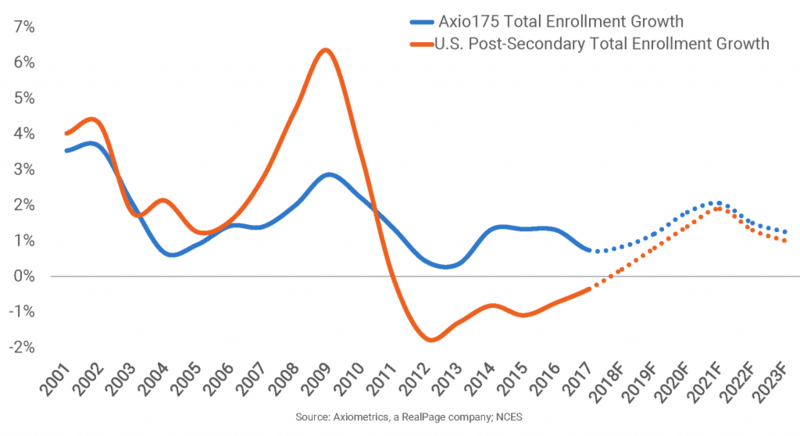 At the 175 core universities tracked by Axiometrics, a RealPage company, enrollment growth trends are reflective of national trends, though these 175 schools have avoided enrollment declines since at least 2001. Enrollment for this set of universities increased in fall 2017 by 0.7%, and a 1.4% average increase is expected through 2023, putting enrollment at this group of universities at 4.5 million students five years from now. Alma Pena is a Student Housing Analyst for RealPage, Inc., focusing on student housing market analysis and data quality. She is responsible for analyzing historical, current and forecasted data to determine and identify common student housing trends. She regularly prepares reports for and works with clients to further their understanding of data methodology and research in the sector. Alma received a bachelor’s degree in international business with a minor in economics from Texas Tech University.